Halophytes are diverse group of plants with tolerance to high salinity due to specific mechanisms of salt uptake and tolerance. Saline areas are being affected by heavy metal pollution also due to many reasons like industrialization, etc. in the recent years. Use of halophytic species for heavy metal remediation is of significant importance as these plants are naturally present in soils characterized by excess of salts. They possess specific mechanisms for uptake, detoxification and extrusion of salts. These mechanisms could help in heavy metal remediation also. 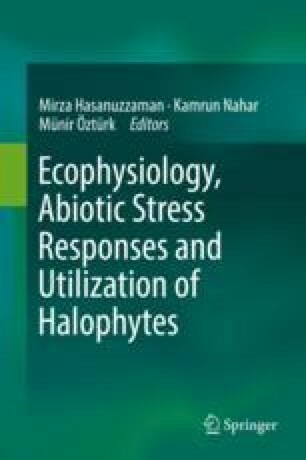 Halophytes are constitutively better equipped to cope with oxidative stress as reactive oxygen species (ROS) are overproduced when plants are exposed to high salt concentrations. Halophytes have higher antioxidant metabolism compared with glycophytes. Heavy metal stress also results in overproduction of ROS. ROS scavenging proteins are particularly critical for plants under salt and heavy metal stress to maintain redox homeostasis. Sulphur metabolism also plays a role in heavy metal detoxification. Heavy metal accumulators have increased cysteine biosynthesis induced by heavy metals. Highly reactive heavy metals such as Cr, Cu and Fe are directly involved in redox reactions and generate ROS, while the redox inactive heavy metals can induce indirect ROS through decrease in antioxidant activity. The oxidative damage caused by overproduction of ROS in heavy metal-contaminated soils of halophytes will be discussed. The antioxidant metabolism of halophytes in terms of heavy metal tolerance also will be discussed as some adaptations to these stresses are common. The role of osmolytes, phytochelatins and metallothionein in heavy metal tolerance will also be discussed.